Some of us who have signed this letter are religious Jews, some not, but we all believe such People-to- People initiatives are important and within Boulder’s long tradition of humanism and empathy for people everywhere. We see such a gesture very much as `a Jewish thing’ to do, to express our sympathy for a people who has long suffered and who deserves the justice and dignity long denied it. There is nothing anti-Semetic, anti-Jewish, or quite frankly, even anti-Israel about such an initiative as some have suggested. To the contrary, it is, instead, a gesture of friendship. We urge the Boulder City Council to support this initiative. Sounds like a better than good idea. Thank you for doing this. As a Jew and traveler to Israel and The West Bank I support all of this. Please add my name to your list. I am a psychotherapist trained in EMDR and would be training their teachers on the use of resourcing, Tai Chi and EMDR as a tool to decrease PTSD and emotional trigger responses in the youth. This would increase their ability to self soothe and reduce physical symptoms of trauma. We would be putting together a manual that would be translated into Arabic for the intern teachers and staff. Right now being directed to funding and a non profit to work with is my largest project. Again thank you, thank you. The sudden effort by some in Boulder to head off the creation of Sister City relationship between the City of Boulder and the City of Nablus seems misguided at best. As you know, I am an active Unitarian Universalist by faith and affiliation however my ancestry is Jewish from the Pale of Russia. For generations, we have been an anti-war family active for peace and justice. Our first family members to live in Colorado arrived in service in the war against Nazi Germany and I stood with CU civil rights supporters on the Boulder Campus while my father’s brother and wife marched with Dr. King on August 28, 1963 ! members of the American Jewish community who do not support Israel policies without questioning the wisdom of those policies and are often much more critical of the treatment of the Palestinians living in the west bank than their parents. In light of the disturbing revelations below, I implore you to reconsider your support for this project. 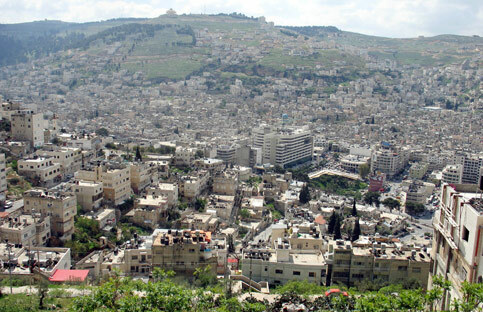 Readily available additional information about Nablus, including its’ residents electing a Hamas-dominated city council and its’ proud status as a terrorist launching pad for killing innocent Israelis might also be eye-opening. There is one resident of Boulder who has ALREADY been “hanging out with terrorists and jihadists” and that’s exactly how this toxic and fraudulent “sister city” scheme got started. The scheme was hatched by Guy Benintendi, who in his blog, “The State of Palestine” identifies himself as an anti-Israel, pro-Palestinian, pro-terrorism extremist. “Pro-Palestinian” for Mr. Benentendi means support for HAMAS’ goal of the elimination of the State of Israel and its’ replacement with a theocratic Islamic state of Palestine which encompasses “every inch” of Israel. There is a picture in circulation of Mr. Benintendi standing out on the street waving his “Zionism is Racism” sign. Small problem: under the U.S. federal “material support” statute, 18 U.S.C. § 2339B, “It is unlawful for a U.S. citizen or a person who is located in the United States to knowingly provide material support or resources to a designated Foreign Terrorist Organization (FTO).” And HAMAS is at the top of the U.S./EU FTO list. This makes Mr. Benintendi a federal criminal suspect in addition to a pro-terrorism death-to-Israel fanatic. This is serious business these days. Violation of the “material support” statute is punishable by up to 15 years in prison and/or a fine of up to $250,000. Now that he has been exposed through his “sister city” scheme, it is probably a matter of time until Mr. Benentendi will be speaking with the FBI. It’s hard to imagine that taking supplies to HAMAS, along with his other trips to the Palestinian territories, haven’t also earned Mr. Benintendi a spot on the U.S. Terrorism Watch List. In a blog post during his mission to supply aid to HAMAS, Mr. Benintendi’s wrote, “From discussions I’ve had with Muslim members of the convoy I’ve learned that this mission we’ve undertaken is, to them, a form of jihad.” Mr. Benintendi voices no objection or unwillingness to being involved in jihad. Mr. Benentendi’s sister city scheme is not original. During the supply convey to HAMAS, Mr. Benintendi became a protege of George Galloway (there is a picture of them yucking-it-up together on Mr. Benintendi’s blog). Mr. Galloway is a British MP and a leading anti-semitic and anti-Israel militant. He was expelled from the Labour Party for his extremist views and activities. Mr. Galloway is from Dundee, Scotland, a city which flew the Palestinian flag inside its’ city hall. And, whaddaya know, Mr. Galloway worked to get Dundee to make Nablus a sister city. In a nutshell, the objective of this “project” is to create an official Boulder-sanctioned propaganda channel to justify Islamic terrorism and promote the HAMAS/Iranian “final solution” plan for the destruction of Israel. The plan is to hijack the sister city ideal, along with the official prestige and credibilty of the City Of Boulder ,as a front for his toxic and dangerous scheme. Advocating hatred and support for terror have no place in Boulder. This scheme must be stopped. Hello, There’s no doubt that your website may be having internet browser compatibility issues. When I take a look at your site in Safari, it looks fine however, if opening in Internet Explorer, it has some overlapping issues. I simply wanted to provide you with a quick heads up! Besides that, great site!